Due to severe thunderstorms forecast for Friday evening, the Dell Music Center will present this concert MONDAY, JULY 31 @ 8 PM! We apologize for any inconvenience and hope you can join us then! Award-winning Music Director Jeri Lynne Johnson, the first African-American woman to win a an international conducting prize, founded the Black Pearl Chamber Orchestra in 2008 as a model for the 21st-century American orchestra. Based in Philadelphia, Black Pearl’s mission is to take the audience beyond spectatorship to participation in the musical experience by combining artistic excellence with innovative hands-on community engagement. 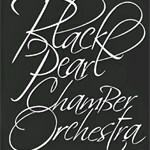 Described by the Philadelphia Inquirer as “first-class on every level,” Black Pearl’s musicians truly reflect America’s ethnic and cultural diversity and have been trained at leading music conservatories around the globe including the Curtis Institute, the Juilliard School, and the Peabody Institute among others. Black Pearl’s programs, guided by its Inreach philosophy, have garnered critical acclaim and accolades including three highly-competitive Knight Arts Challenge awards and prestigious grants from the National Endowment for the Arts. Here's a great thumbnail sketch about Black Pearl- enjoy!